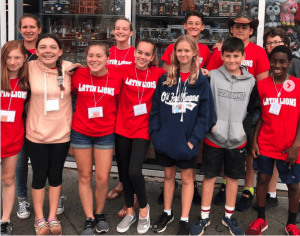 The excitement was in the air as WA students arrived in Orlando for the 70th Annual State Latin Forum competition this past week. Our Latin students from seventh to eleventh grade were put to the test from Wednesday, April 3 to Saturday, April 6. WA joined over 1,200 Latin students from over 60 schools that qualified. Together, the crowd celebrated the Latin language and Roman culture. Students participated in various activities like impromptu art, an academic decathlon, and various academic tests. Abby Weissman and Cason Alday — 5th in Venus and Adonis. Congratulations to all of our Latin students on their hard work, dedication, and willingness to participate. And thank you especially to their families that helped to make it possible. Valēte Omnēs!